What is Downmixing? Why Do We Need to Downmix 5.1 to Stereo? 5.1-channel surround music, usually in the forms of Dolby Digital AC3 and DTS will undoubtedly make music lovers feel the realism surrounded by music, is a wonderful enjoyment. However, the establishment of the surround sound system and the purchase of other necessary equipment require much cost. At the same time, the 5.1 surround audio source is relatively rare and the volume is pretty large, it makes sense for movies and home theater. But as for music, it's always recorded in stereo sound that is supported by most portable devices. So, we need to finish 5.1 downmix conversion, downmixing is the action of taking a surround mix and having it be instantly compatible in stereo. Here's how to downmix 5.1 to stereo to play multichannel audio files at stereo systems. 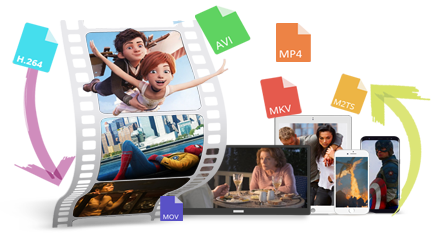 Free HD Video Converter Factory can help us convert 5.1 to stereo without stress, even a novice can complete the conversion in a few clicks. In addition, the software can also convert audio formats, custom audio settings including bit rate, sample rate, etc. Just have a try! For converting 5.1 audio to stereo, an easy-to-use 5.1 to stereo converter is a must. Free HD Video Converter Factory is not only a free video converter but also an audio channel converter that allows you to downmix 5.1 to stereo easily. Now, free downloadfree download this software and follow the tutorial below to find out how to convert 5.1 audio to stereo effortlessly. Free downloadFree download, install and launch WonderFox Free HD Video Converter Factory on your PC. Click on “Add Files” to load source 5.1 audio files into program. Besides, directly drag and drop files into the interface is also allowed. 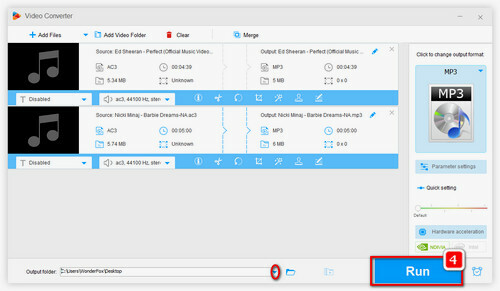 Now, click on “Output Format” section on the right side of the interface and choose one output format for the audio file, such as choosing “MP3” under “Audio” tab. Then, let’s go for the “Settings” window for downmixing 5.1 to stereo. Click on “Settings” button on the lower right side. As you can see, you can convert 5.1 audio to 2 channels stereo under audio channel tab. Finally, click “OK” to save the setting. 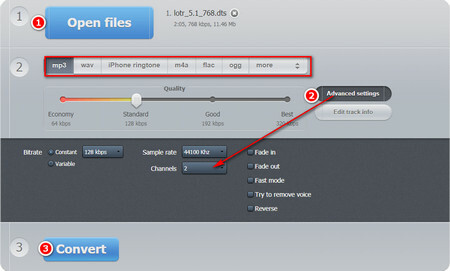 Tips: At the “Settings” window, you can also change MP3 bitrate, sample rate as well as normalize audio volume. Finally, you only need to set the path for the output file on the bottom of the interface, and click on blue “Run” button to finish 5.1 to stereo conversion. Step 1: Run VLC Media Player, and click on the menu bar Media > Convert/Save, or directly press the shortcut Ctrl+R. Step 2: Click Add to import the 5.1-channel surround music file, then press the Convert/Save button below. Step 3: Click on the Profile drop-down list and select "Audio - MP3". Of course, you can also choose OGG, FLAC, CD (WAV). Step 4: Click the wrench icon next to open the Profile edition window, switch to the Audio codec tab, check Audio, then fill in the Channels below 2, and click Save. Step 5: Next, select the output directory by click “Browse” button, and finally, click the Start button to start 5.1 to stereo conversion. Now, some online audio & video converters are also qualified for the 5.1 to stereo converter. Here we take https://online-audio-converter.com/ as an example to show you how to downmix 5.1 audio to stereo online. 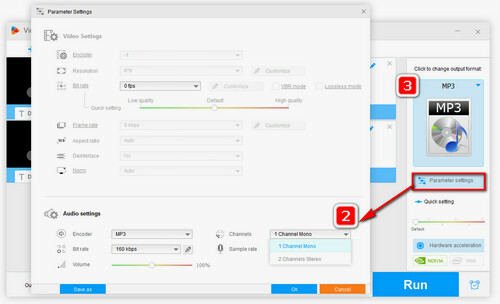 Step 1: For downmixing 5.1 to stereo online, firstly, visit https://online-audio-converter.com/. Step 2: Click on “Open Files” to load 5.1-channel surround music file. Step 3: Select an output audio format you desired like MP3, WAV, M4A, OGG, etc. Then, click on “Advanced settings”, here you can set the audio channel for 2. 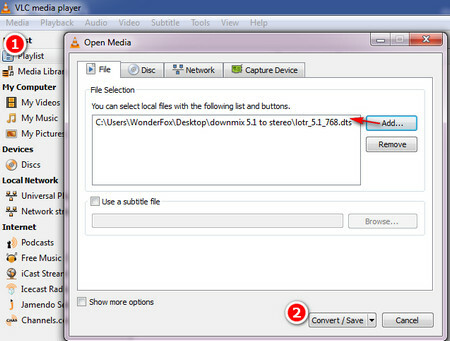 Step 4: Click Convert to start the 5.1 to stereo conversion, and finally, download the converted file to the local. 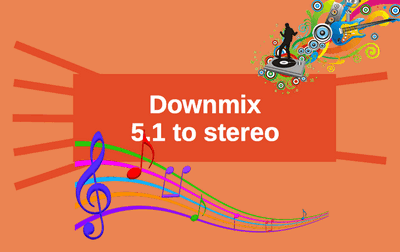 Now, you have got three completely different ways to downmix 5.1 audio to stereo. In fact, downmixing is not as difficult as you think, right? Finally, hope this article is really helpful to you and you are free to share it with more people! With HD Video Converter Factory Pro, you are allowed to convert multiple 5.1-channel audio files at once so that can save you a lot of time and effort. Besides, this software can also help you cut audio clips, download music from YouTube, Facebook, etc. Try it for more features.